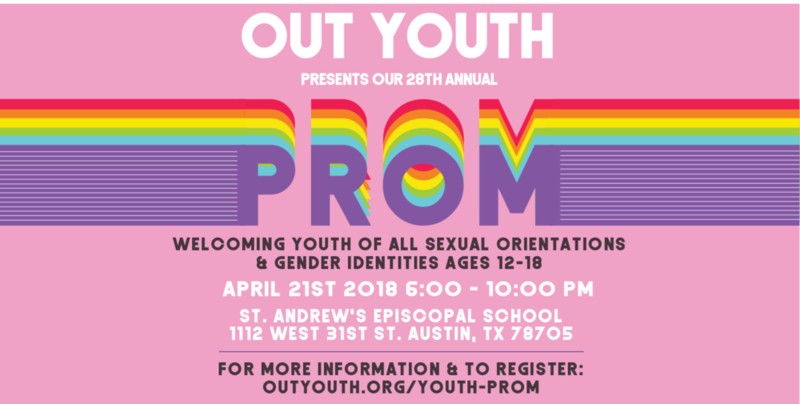 The Out Youth Prom is a time for youth ages 12 to 18 of all sexual orientations and gender identities to experience an environment where they are loved, acknowledged, and accepted for exactly who they are - while they dance and sing and celebrate their authenticity! We'll have a DJ and there will be a photobooth available to capture all your Out Youth Prom memories! We are suggesting a $10 donation to help us cover the cost of the Prom, but no one will be turned away! If you are able, donate $20 dollars and help send a youth to Prom who cannot afford it. Yes! We'll have a photo booth again this year. All photos will be uploaded to a password-protected website so that youth who are not yet out to their friends and families can feel safe to participate. We suggest you wear something comfortable and that makes you feel good about yourself. It is not required that you wear an outfit that matches the theme of the event (since we just use the theme to base the decorations on). Will there be food and non-alcoholic drinks at Prom? We will have some light snacks as well as water, sodas, and juice. Because we're not serving a meal, we recommend that you eat ahead of time. Only youth ages 12 to 18 will be allowed to enter the event. Drugs, alcohol, tobacco products, vapes, and weapons are not allowed at the Out Youth Prom. No, but it will make checking in easier. We may also be able to scan your registration bar code from your phone. What kind of adult supervision will be at the Prom? Out Youth staff members will be supervising the Prom along with board members, interns, and over 30 volunteer chaperones. If you have any specific questions about supervision, please contact Kathryn Gonzales. Questions that would make great FAQs will be added as they come in.